Town Manager Robin Crosbie presented the FY2010 Budget to the Select Board on February 23 for initial review and discussion. A copy of the FY2010 Town Manager's Budget Report is now available online as well as the detailed FY2010 budget summary. If you are looking to watch the February 23 Select Board meeting, it is now available for web viewing on the LCTV website. LCTV will be posting web rebroadcasts of both the School Committee and Select Board meetings on their website every week. Here is a direct link. Play the Windows Media Player version of the broadcast so that you can fast forward to the topic of interest. Because tonight's Select Board meeting was not be televised live on LCTV, I decided to attend to hear Robin Crosbie/ Town Manager review the FY2010 budget. A few copies of her presentation were handled out and I have asked for a copy (as well as a copy of the full budget report) to post on the Longmeadow.org website. Note: Because the schedule called for live broadcast of the School Committee meeting, LCTV videotaped tonight's meeting for broadcast later this week. The FY10 budget is revenue based. Some unanticipated FY09 shortfalls (excess snow/ice removal costs + lower than expected revenue from excise taxes and investment income) affected the available free cash to be used to fund the FY10 budget. The budget is based upon the most recent revenue and state aid estimates which could easily change (--> lower) in the future. No cost of living adjustments (school or town) are included with the proposed budget. With town employee and school department teachers contracts expiring in June and August, there is a potential increase in overall costs of $300,000/ % increase in COLA. In spite of our recycling efforts, the cost of curbside waste collection is projected to increase by $46K in FY2010 ( a 6.4% increase) mostly because of the reduced value and revenue (-$43K) of recyclable materials. The Longmeadow School Dept budget as provided to the Town Manager was cut by $117K (FY10 requested = $28,569,837 vs. FY10 Recommended = $28,452,152). I was glad that the Select Board decided to spend more than the allocated 15 minutes (actually close to one hour) to listen to the TM's presentation and to ask questions about the budget. Paul Santaniello, SB chair indicated that this will be the first of a number of discussions over the next three weeks to finalize the budget for presentation at the Annual Town Meeting. Overall, a good start by the Town Manager to a difficult budget process. 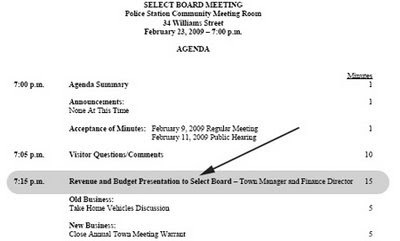 Based upon the agenda for tomorrow's (2/23/09) Select Board meeting, it appears that we will be getting a 15 minute review of the Town Manager's FY2010 Budget Report. I would encourage Longmeadow residents to watch this discussion on LCTV at 7:15 PM. Update: The SB meeting on 2/23 will not be broadcast LIVE. With only 15 minutes, I suspect that our town manager will only be able to review overall budget highlights. 15 minutes seems much too short a time for such an important topic so hopefully the SB chairman will extend this allocated time. I am particularly interested in how this budget report handles the potential shortfall in revenue to cover the upcoming town employee collective agreements that are expiring at the end of the current FY2009 year. I'm guessing that the proposed balanced budget will not include any provision for possible town employee related salary increases for the FY2010 budget nor budget any funds in this direction or include any contingency plans. The Longmeadow School Department proposed budget for FY2010 that was approved last week by the School Committee which was $83K less than the current FY2009 also did not provide for any teacher salary COLA increases. The SC did acknowledge that any teacher salary increases must be met with additional school department budget cutbacks in order to meet the FY2010 budget commitment to the Select Board. I would expect that the Town Manager and Select Board also need to work out the details on how to fund the FY2009 revenue shortfalls before they can fully understand all of the revenue sources such as "free cash" and the operational stabilization fund for FY2010. Everything that I read in the newspaper seems to suggest "a not to worry attitude" and that Longmeadow is much better off than the rest of the town and cities in Massachusetts. That attitude seems strange given all of the budget issues that we have faced during the past couple of years. Stay tuned for an interesting budget season.